After spending the morning watching the seals and sea lions sunning on the pier in Moss Landing, we headed to Monterey for more of the same. Monterey is a beautiful area with its beaches, seals, and scenic drives. Before beginning the famed 17-mile drive, we headed over to Ambrosia India Bistro for lunch because we heard they offered many vegan options. 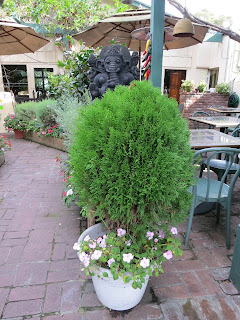 Located in downtown Monterey, it was easy to find and much bigger than we had expected. 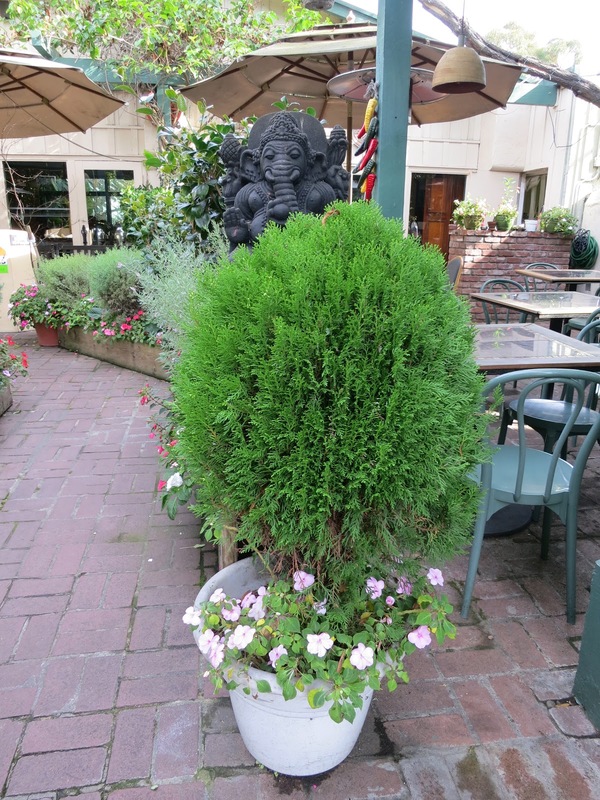 Ambrosia has a large outdoor patio decorated with Indian deities and plants. We took a seat inside and immediately inquired as to what was vegan on the lunch buffet. The salad, of course, was vegan along with three entrees. I decided that was plenty for me and for $10 you really can't go wrong. The waiter was very helpful as he quickly informed me that the rice is cooked with a bit of milk to make it whiter and offered me a special saffron rice instead. They also offered me vegan roti. Very nice. Since there were only three entrees, I had to try everything. The salad bar had a few standard, but very fresh items on it like lettuce, cucumbers, carrots, and red onions. The cilantro dressing really made this salad. Of the three items, I enjoyed the Tadka Daal the best. It was made of yellow lentils cooked authentically. I found the Aloo Bhujia to be quite flavorful as the potatoes were covered in Indian spices. The Vegetable Molly was probably the least exciting. This dish had curried mixed vegetables in a coconut-based curry. It needed more spice. That said, the chutneys were delicious! One of them was very hot and added a lot of flavor to the dishes. Ambrosia India Bistro offers a ton of vegan options on their regular menu and adequate options on the lunch buffet as well. It is a great place to go for lunch or dinner. You really can't beat a lunch buffet like that for $10 per person. The service was great as well. Now, off to the seals!